Douglas County School District Nutrition Services is committed to providing the highest quality meals for your child. We work to create an environment where your child can learn to make healthy decisions that lead to a healthy lifestyle. We provide approximately 30,000 nutritious meals every day to students and staff. We participate in the National School Lunch Program and the National Breakfast Program (at select sites). School meals are important to your child because they help develop sound nutritional habits by exposing students to a variety of foods. We offer many food choices and provide healthful fruits and vegetables daily. In addition, the well-nourished student has better attendance, is more attentive, better behaved and has an increased energy level. All of these elements are tied to academic success. Food safety is our first and foremost concern. We have implemented a Hazard Analysis Critical Control Point (HACCP) Program throughout the District to reduce the chance of a food-borne illness event. Temperatures of all food products are monitored throughout production and service. School meals contain 30 percent or less of total calories from fat, less than 10% total calories from saturated fat, 35% sugar and contain at least one third of the RDAs for protein, Vitamins A and C, Iron, Calcium and calories. Every day, students choose their meals from a variety of fresh fruits and fresh vegetables, whole-grain breads and cereals, lean meats, and low-fat dairy products. Each school has a Harvest Bar which features a variety of fresh produce in season. We invite our parents and families to come and see how school lunch has changed. Parents are always welcome! We are proud of our program and our hard-working employees and we encourage you to eat with your child. DCSD Nutrition Services invites all parents to have lunch with their children at any time during the school year. The cost is just $3.50 for an adult meal without milk; with milk the price is $4.25. 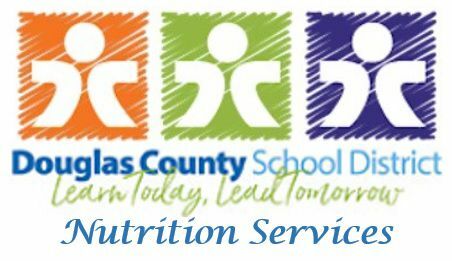 Douglas County School District (DCSD) Nutrition Services operates as a self-sustaining enterprise fund to offer nutritious, appealing meals and ala carte food items to DCSD students and personnel. We support DCSD’s students and our community with resources which promote optimum learning and wellness. *We believe all students should have access to a nutritious meal. *We support U.S. agriculture and purchase locally when possible. *Each employee has the opportunity to contribute to our success. *Each employee has access to ongoing Professional Development. *We believe Nutrition Services plays an integral part in education. *We embrace the challenges of the future. *We believe in open lines of communication with all stakeholders. *We seek and welcome all feedback. *We believe trust and integrity to be the corner stones of our program. *We believe that it is our responsibility to model leadership.